comme engourdi sous la neige. Marion Poschmann was born in 1969 in Essen and grew up in Mülheim an der Ruhr and in Essen. 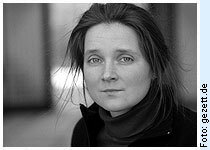 She studied German philology, philosophy and Slavistic philology (1989-1995), first in Bonn; since 1992 in Berlin - in 1994 she also studied Dramatic Writing at the University of the Arts Berlin. Between 1997 and 2003 she taught German in the context of a German-Polish primary school project called Spotkanie heißt Begegnung. She is a member of P.E.N and lives and works in Berlin. Zur Dichtung Catharina Regina von Greiffenbergs.